Our flight with Ted Grant into the Nahanni country by way of Little Doctor Lake, the Ram Canyons, and the Ragged Range is forever impressed upon my mind. It was truly magnificent. We offer day tours that are sure to be the experience of a lifetime – flying into the spectacular wilderness over Canada's deepest canyons that make up the Nahanni National Park Reserve. You will see why this is a UNESCO World Heritage Site. Now six times larger, the recent expansion makes this the third largest park in Canada. 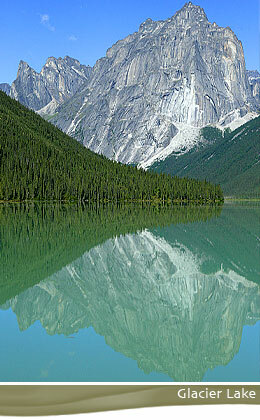 Approximately 500 km west of Yellowknife, the park protects the Mackenzie Mountain Range. Chuck Strahl, Minister of Indian Affairs and Northern Development, explains, "The expansion of the reserve will ensure that Nahanni can continue to be revered as a place shrouded in mystery, spirituality and healing." 'Nahanni' is an indigenous Dene word and can be translated as 'spirit'. Untamed rivers and jagged mountain peaks like Vampire Peaks and the Cirque of the Unclimbables share their wild secret with hot springs, tufa rock and the incredible Virginia Falls; where you will find breathtaking pristine nature, with rapids and waves stretching for eight kilometers then returning to their voyage of the South Nahanni River, truly the centrepiece of the park. Four majestic canyons line this spectacular whitewater river. You will be flying on a floatplane, taking off from the shore of the Mackenzie River at the Simpson Air float base. You will soar through First, Second and Third Canyons. Enroute your pilot will share the legends associated with Deadmen Valley, Headless Range, Funeral Range and Death Lake. Keep an eye out for Dall Sheep and mountain caribou racing over the cliffs and slopes below. You will land on the South Nahanni River at the top of Virginia Falls. Whitewater plunging 92 meters into the Painted Canyon is an awe-inspiring sight and sound. A great tower of rock sits squarely in the middle, defying the force of nature. The Dene people believe this rock to be the spirit of the Naha, a notorious tribe of mountain warriors. Follow along the top of the falls and the Sluice Box to picturesque photo locations, or you can follow the portage trail to the bottom of the falls to experience the power of this spectacular natural wonder. 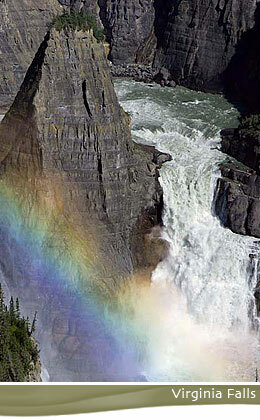 On the return trip you'll fly-over the Nahanni Plateau and Ram River Canyons. A short stop at Little Doctor Lake and the Nahanni Mountain Lodge will allow you to relax on the sand beach or swim in the quiet lake – take photographs of the scenery, the birds, or the wildlife nearby before returning to Fort Simpson. We also offer Virginia Falls fly-over tours. These tours are done in our airplanes without floats; the plane does not land in the Nahanni National Park; however you will still see all the amazing sights. The Tour is conducted in our spacious Cessna 206 aircraft which can seat anywhere from 1 to 4 adult passengers or 3 adults and 2 children. Every seat is a window seat! 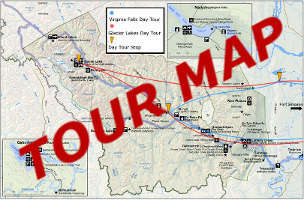 This journey starts as the Virginia Falls tour, but continues further into the mountains. After experiencing the magnificence of Virginia Falls, you will fly up to Glacier Lake where you will see the magnificent Cirque of the Unclimbables, a group of several cirques with 9000' peaks that drain through Fairy Meadow, an idyllic alpine garden. A brief stop at Glacier Lake allows you time to take in the spectacular view of Mount Harrison Smith – one of the highest mountains in the Ragged Range. Continuing the tour over Rabbit Kettle Lake, you will see the Tufa Mounds. A stop at Little Doctor Lake and the Nahanni Mountain Lodge to relax and enjoy the scenery completes the tour as you head back to Fort Simpson. 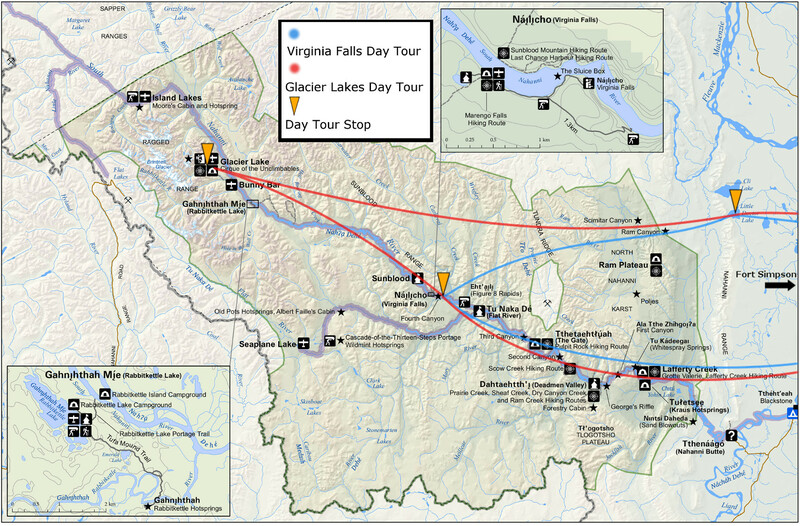 We also offer Glacier Lake fly-over tours. These tours are done in our airplanes without floats, the plane does not land in the Nahanni National Park, however you will still see all the amazing sights. The experience of your lifetime, with our lifetime of flying experience in the Nahanni.